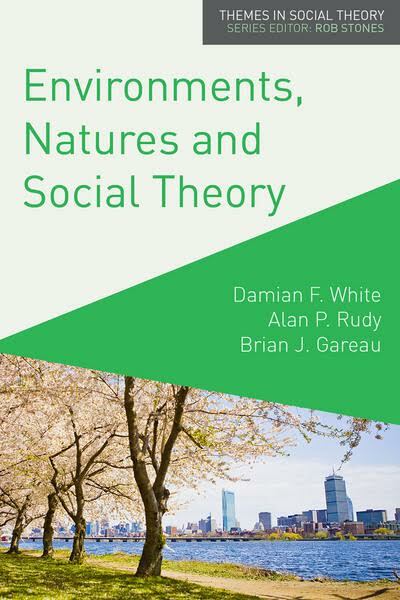 Damian White, Alan Rudy (Sociology PhD, '95), and Brian Gareau (Sociology PhD, '08) will publish Environments, Natures and Social Theory in October 2015. "Finally a book that moves an environmentally sensitive social science beyond the moribund straightjacket of 20th century environmental and social theory. A must read for anyone concerned with the need for an ecologically saner and socially more humane world." "White, Rudy and Gareau are three of the liveliest minds in environmental social sciences today. Pointing to a reflexive re-engagement with the world, their book is vast in ambition and scope." From climate change to fossil fuel dependency, from the uneven effects of natural disasters to the loss of biodiversity: complex socio-environmental problems indicate the urgency for cross-disciplinary research into the ways in which the social, the natural and the technological are ever more entangled. This ground breaking text moves between environmental sociology and environmental geography, political and social ecology and critical design studies to provide a definitive mapping of the state of environmental social theory in the age of the anthropocene. Environments, Natures and Social Theory provokes dialogue and confrontation between critical political economists, actor network theorists, neo-Malthusians and environmental justice advocates. It maps out the new environmental politics of hybridity moving from hybrid neo-liberals to end times ecologists, from post environmentalists to cyborg eco-socialists. White, Rudy and Gareau insist on the necessity of a critical but optimistic hybrid politics, arguing that a more just, egalitarian, democratic and sustainable anthropocene is within our grasp. This will only be brought into being, however, by reclaiming, celebrating and channeling the reconstructive potential of entangled hybrid humans as inventive hominids, creative gardeners, critical publics and political agents. Written in an accessible style, Environments, Natures and Social Theory is an essential resource for undergraduate and postgraduate students across the social sciences. Damian White is Head of the Department of History, Philosophy and the Social Sciences at the Rhode Island School of Design, USA. Alan Rudy is Assistant Professor of Sociology at Central Michigan University, USA. Brian Gareau is Associate Professor of Sociology and International Studies at Boston College, USA.